She moves off as I mount, keen to get going. Keen to march down the track and out of the farm where she stays, keen to look at everything around her in the spring sunshine. She takes in all the differences of the walk today, from how it was yesterday - noticing rubbish in the hedge, a fallen log in a field, egrets standing on the back of the sheep and the puddle on the road which has never, ever been there before. She spooks, she runs, she snorts, she looks left, she looks right - she rarely settles on our walks out into the big, wide world. Kira is my feisty horse who has had a rough start in life. Despite her nervous ways I have learnt to sit still and let her have a good look at all around her. 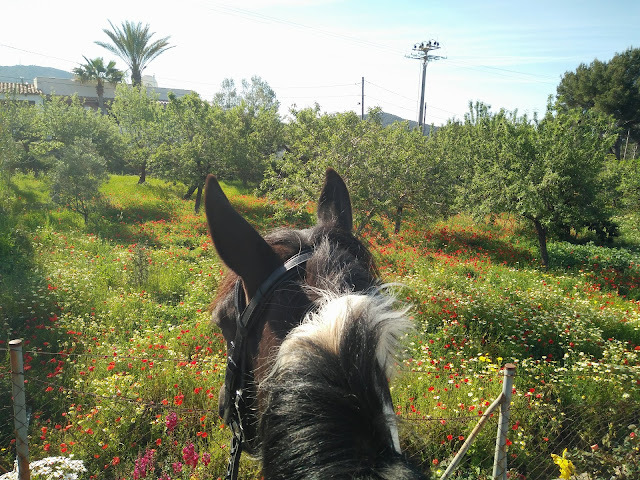 We walk past the donkeys who gallop over to say hello, she strains her neck to look at them and decides they pose no threat, long eared and beneath her - she walks on. The dogs to the right don't even get a look in, we know their barks and their non-threatening waggy tails. Hello doggies I call, they ignore me completely - not speaking any English I suppose - and continue their frenzy at the passing horse. There is no greater smell than orange blossom; it beats freshly brewed coffee, baking bread and just-mown grass. The orange orchard to our left engulfs our olfactory senses, the heady sweetness lingers in the air while the uncollected oranges lay fallen and abandoned on the ground. She uses all her body to naviagte the steep hills and she baulks at the group of cyclists who whizz at speed, making the air whistle as they pass. She tenses as we approach the dog she hates, spooking predictably as he runs along the fence - every time dear Kira - every time. She stands patiently as I talk to a new friend over a fence, in potted Spanish and plenty of gesticulating. I like him, he always admires my horse, as wonky and nutty as she is. We negotiate pigs, bouncy lambs, hectic hairy ponies in herds and the fiercest German Shepherd's who pounce against the fence - rattling it menacingly. Tourists point at us, old men begrudgingly say 'bon dia' as they forage for wild asparagus in the hedges and walkers avoid us as she side-steps up the road to avoid a murderous plastic bag. Her body relaxes as we walk the familiar mile back to her stable, I feel as happy as I have ever felt in my life. 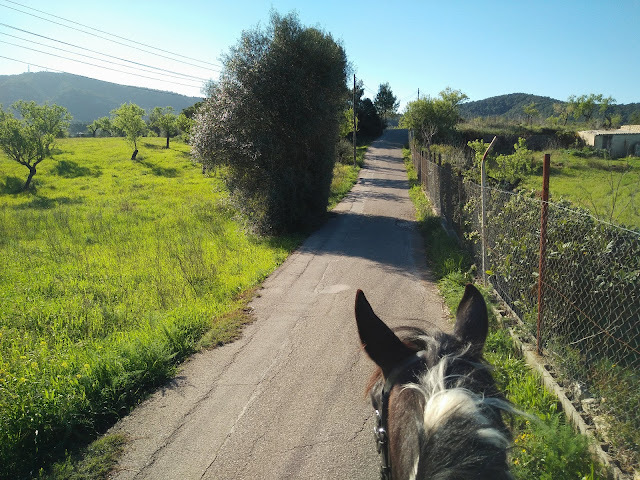 Just me, my horse, the spring sunshine and beautiful, beautiful Mallorca.